Add some homegrown flavor to your winter meals. From microgreens to tomatoes, it is possible to grow produce indoors. Microgreens are a quick and easy way to add some flavor and crunch to your plate. Just plant seeds labeled for sprouting or microgreens in a shallow container filled with a sterile potting or seed starting mix. 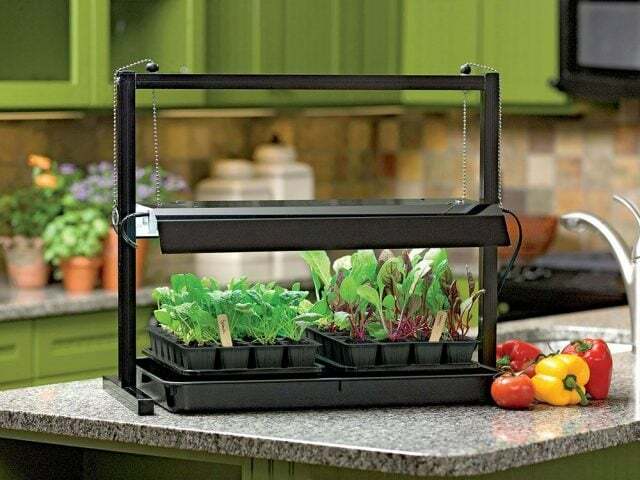 Within two weeks you will be harvesting nutritious mini vegetable and herb leaves for salads, sandwiches or snacking. Increase your indoor growing space by going vertical. Shelf units with built-in light fixtures like the Stack-n-Grow Light System, provide multiple layers of growing space. Gardening expert, TV/radio host, author & columnist Melinda Myers has more than 30 years of horticulture experience and has written over 20 gardening books, including Small Space Gardening and the Midwest Gardener’s Handbook. She hosts The Great Courses “How to Grow Anything: Food Gardening For Everyone” DVD set and the nationally syndicated Melinda’s Garden Moment TV & radio segments. Myers has a partnership with Gardener’s Supply Company and is a columnist and contributing editor for Birds & Blooms magazine. Myers’ web site, offers gardening videos and tips.